Romney Calls The U.N. A "Failure"
Republican White House hopeful Mitt Romney called the United Nations a failure on Thursday and said he would support a new coalition of the free nations of the world. The former Massachusetts governor said the U.N. Human Rights Council has repeatedly condemned Israel while taking no action against nations with repressive regimes. "The United Nations has been an extraordinary failure of late," Romney said in response to a question at a pancake house along the coast of early voting South Carolina. "We should withdraw from the United Nations Human Rights Council." Actually, the United States doesn't have a seat on the human rights council, which it has been boycotting. Romney spokesman Eric Fehrnstrom later clarified the remarks. "The governor believes we ought to withdraw completely from the U.N. Human Rights Council, and that means ending our financial support in addition to not seeking a seat on the council," Fehrnstrom said. "We should not legitimize the council, either with financial or diplomatic support." Romney also said he would support a new "coalition of the free nations of the world and bring those nations together so that we can act together." "We should develop some of our own  if you will  forums and alliances or groups that have the ability to actually watch out for the world and do what's right," Romney said. Romney was sharing the political attention in this state with GOP rival John McCain, who is on his second consecutive day of campaigning here. McCain, in an interview with The Associated Press on Tuesday, accused both Russia and China of causing gridlock in the U.N. Security Council and hindering the world body's ability to sanction Iran or address pressing matters in Darfur, Burma and other trouble spots. If elected, McCain said he would form a league of democracies to circumvent the Security Council and enact tough sanction against Iran and other problem countries. Romney, who has been criticized for his changing view on abortion, was also asked where he stood on the issue that is important to voters in this conservative state. "I am pro life and I am proud to be pro life," Romney said. The former governor also said he would oppose using federal dollars for abortions and would appoint Supreme Court justices opposed to abortions. He said he opposes using cloning or practices that create human cells for stem cell research. On Thursday, the Romney campaign also unveiled a Web ad featuring Romney's wife, Ann, praising Romney as a good father and husband against a video backdrop of family gatherings and horseplay. The ad, called "Our Home," comes just a day before Romney speaks in Washington to social conservatives at the Value Voters Summit. It also dovetails with Romney's recent pitch that the best way to guarantee the well-being of children is through two-parent families. The Romneys have five sons and ten grandchildren. 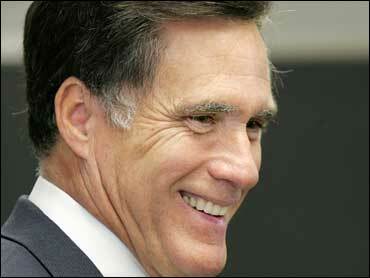 Of the leading Republicans in the presidential contest, Romney is the only one who has not been divorced. "Mitt says his greatest success is being able to say 'I have been a good father, and a good husband,"' Ann Romney says in the ad. "Mitt says there's no work more important than what goes on within the four walls of the American home. And that's the way it was in our home."